Although Bushtits are among our state’s smallest birds (I think of them as golf balls with wings), they do not let size limit their ambitions. On the contrary, Bushtits entertain expansive notions about their domiciles. A committed couple measuring only four and a half inches each can build a bag-nest that hangs down as long as twelve inches – some three times their own length. The Bushtits glue the beginnings of their bags onto twigs or branches, and then they weave the bag itself out of spider silk, grass, fluff, and lichens. You might ask: What’s the point of such a large nest? After all, our similarly-sized Anna’s Hummingbird builds a teeny cup of a nest that barely contains the operative part of her brooding mechanism, i.e, her belly. The rest of her sticks out preposterously from each end. Even the Bald Eagle, no slouch when it comes to thoughts of status, builds a nest that is so small, relatively speaking, that when the usual two babies get to be teenagers, they have to perch on the rim. The nest cup is way too small to accommodate them. In all fairness to the Bushtits, they do not build large to impress the neighbors, as people do now and then. Rather, they do it to minimize their own need to sit on eggs for long periods of time. 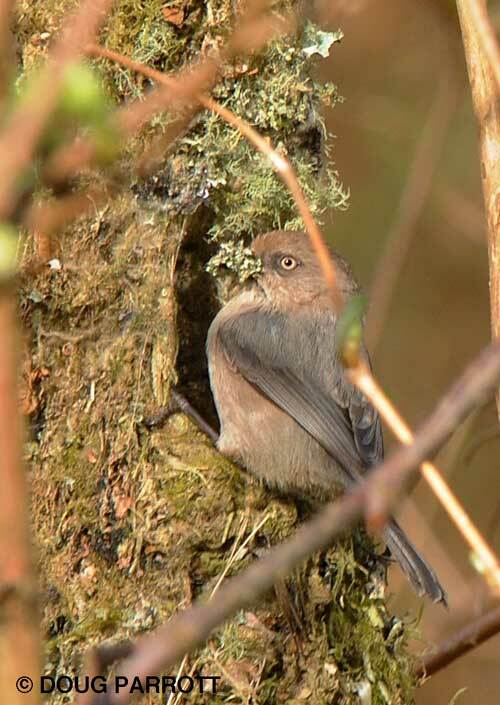 Because the nest is so well insulated, Bushtits need to brood their eggs for only 40 percent of the day. The rest of the time, they can be out hunting for their own food: spiders and small insects. The Bushtits at the Fill are doing well this year. Several of them have already built their nests and are probably brooding eggs. Many may find the time to have a second brood later in the year. If you look carefully, you can find their bag-nests hanging in several locations on site. One such nest is attached to a huckleberry tree on the northwest side of the cottonwood grove near East Point, very near the Loop Trail. If you are careful not to disturb the parents at work, you can observe them coming and going into the hole at the top of the nest. The male has dark eyes; the female has light eyes. This entry was posted in Uncategorized on April 4, 2010 by constancesidles.